New government rules have mortgage lenders checking, and double-checking, the income status of borrowers. Now more than ever, lenders want to ensure that home buyers have the ability to repay their loan obligations. It’s a sign of the times. So, how much do you need to earn to buy a house these days? Here’s an updated look at mortgage requirements for 2015, and the government rules that are influencing them. Several new lending rules have taken effect over the last couple of years. The most notable were the Qualified Mortgage (QM), the Ability-to-Repay (ATR) rule, and the recently finalized Qualified Residential Mortgage (QRM) rule. In October, the Federal Deposit Insurance Corporation (FDIC) and five other agencies finalized the definition of the QRM rule. In short, they aligned it with the previously announced QM rule. The QM rule gives lenders and incentive to make “safer” mortgage loans. It does this by offering legal protection from consumer lawsuits. The QRM rule gives a lenders a way to circumvent risk-retention rules that would otherwise require them to retain 5% of their loans on the books. The Ability-to-Repay (ATR) provision requires lenders to fully document and verify a borrower’s ability to repay a home loan. It’s an alphabet soup of acronyms that all add up to one thing: sensible lending guidelines. Here’s how the new rules will affect mortgage income requirements in 2015 and beyond. 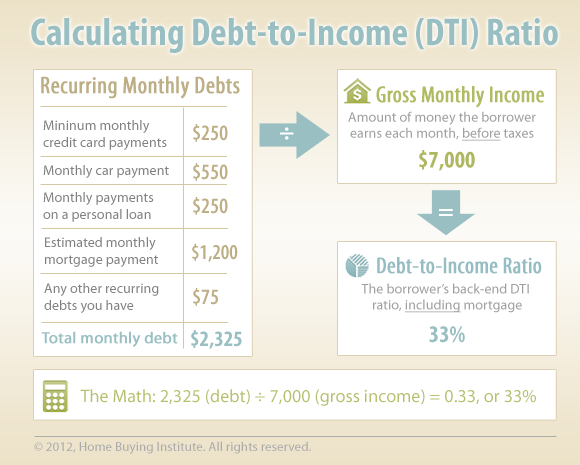 Both QM and QRM feature a 43% debt-to-income (DTI) limit for borrowers. This means a borrower’s total recurring debts should add up to no more than 43% of his or her gross monthly income. That is, if the loan is to be considered QM / QRM compliant. Additionally, lenders are not being forced to comply with the QM standard. They are given strong incentives to use the standard — but they are not being compelled to do so. He explained that mortgage companies can issue non-QM home loans simply by using their own judgment and underwriting guidelines. The important thing is that they evaluate the borrower’s ability to repay the obligation, to comply with the aforementioned ATR rule. In 2015, borrowers should expect a slew of paperwork requests from their lenders. They’ll be asked for W-2 forms, tax returns, bank statements, pay stubs, and other documents relating to their income and assets. This is all part of the verification process mandated by ATR. Some lenders may impose a 43% DTI limit on borrowers, in order to capitalize on the “rewards” of being QM / QRM compliant. Other lenders will continue to offer financing to well-qualified borrowers who are above the 43% threshold. A Different Question: How Much Can You Actually Afford? These days, a lot of mortgage companies sell the loans they make into the secondary market. They don’t always keep them on the books. Additionally, government insurance programs like FHA ensure that lenders get paid, even if a borrower defaults on the loan down the road. So in many cases, lenders bear very little long-term risk from the loans they produce. Refer back to the mantra above. Mortgage income requirements and monthly payment affordability are two different things. Borrowers must decide where their comfort zone lies, in terms of monthly housing costs. This is the borrower’s responsibility — not the lender’s. We encourage home buyers to create a monthly housing budget and spending limit, and to have it on paper before they start shopping for a loan. Here’s one way to go about it. Disclaimer: This story provides an overview of mortgage debt-to-income requirements for 2015. These are general rules that apply in some scenarios, but not in all scenarios. Individual lenders have their own guidelines and criteria for borrower income. There are exceptions to the rules mentioned above. Some of these exceptions were touched on above, while others were omitted for the the sake of brevity. Every lending scenario is different, because every borrower is different. The only way to find out if you are qualified for a home loan is to apply through one or more lenders.